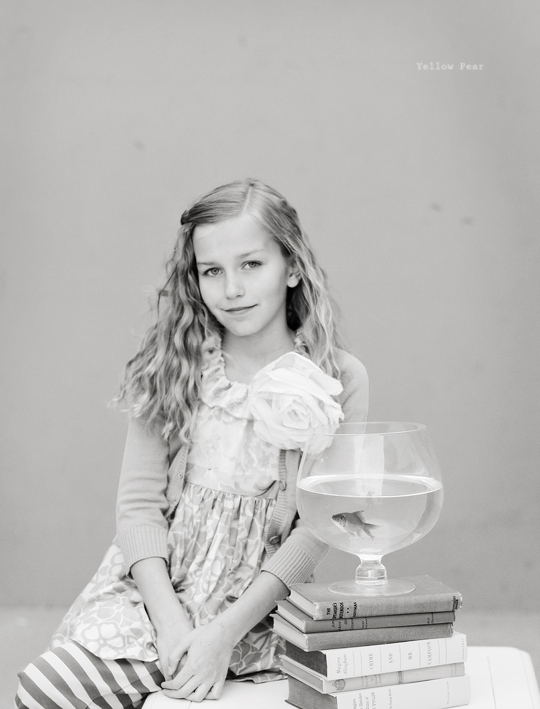 Here is my entry for Round Two in the Matilda Jane Photo Love contest. We each got the same green top, striped pants and green flower that had to be in the photo somewhere. They will choose only ten to continue. I still feel lucky to have had the chance to participate. 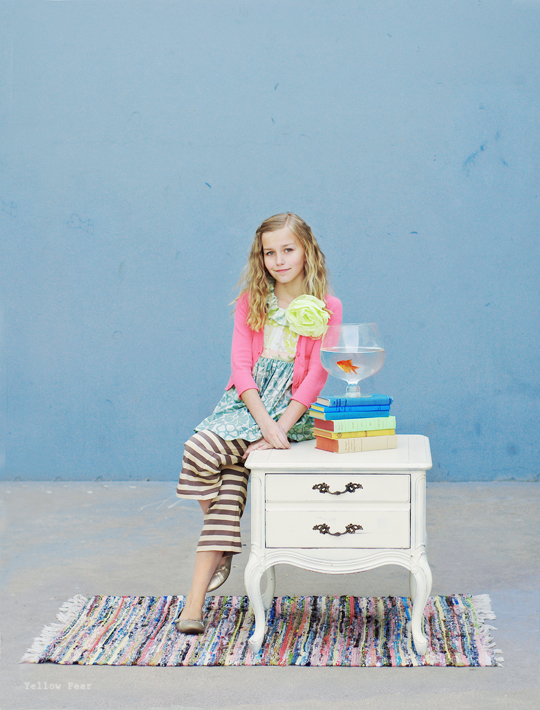 I wanted something fresh, clean and bright for my entry, and I wanted a goldfish. All I could think about for weeks was a goldfish (ask my family members and close friends). We named the fish MJ because, after all, these photos are the only reason he came to live with us. It took one mother, three sons, a daughter, one big goldfish in a plastic container, 6 books, a rusty wagon, one antique end table, various and assorted water bottles full of de-chlorinated water, an open-air racquetball court, one Matilda Jane outfit, a borrowed pink cardigan, a thrift store fish bowl, a bottle of hairspray, a baggie of hair ties and bobby pins, and a rag rug to get these shots. The two big boys played at the play ground just a hop, skip and a jump away. Q decided it would be more fun to dump out the entire bag of hair ties, pull the wagon around...stopping only in places that would be in the shot, dart off from time to time without warning, and walk through giant puddles of water just to spice things up a bit. Also, we were in one of four connected courts, so there were three games going on at the same time all around us, with more people waiting to use our court. There were constant pings and people coming over to get lost balls...as well as passersby stopping to wonder why we had a fish, an end table and a rug in a racquetball court. We had lots of looks as I hauled the end table back and forth between the car and court, followed closely by Miss B pulling a wagon piled high with supplies...and a collection of ragamuffin boys tagging along. And getting a fish to pose and/or hold still is impossible. You just have to wait for it. 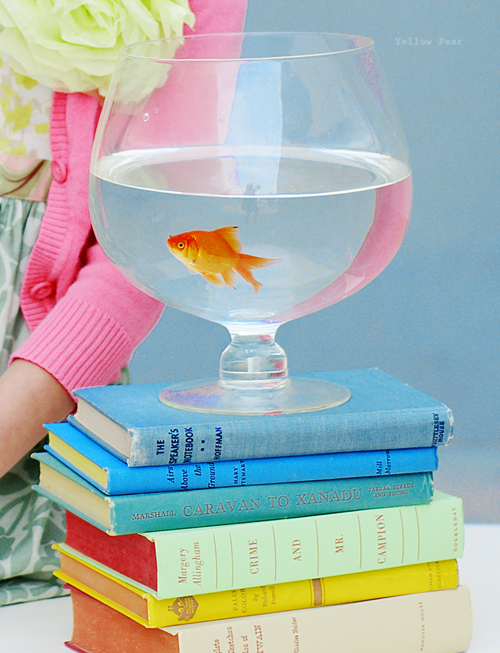 Okay, so your fish and the bowl are a cute touch. Good luck. P.S. Good luck in the contest!! 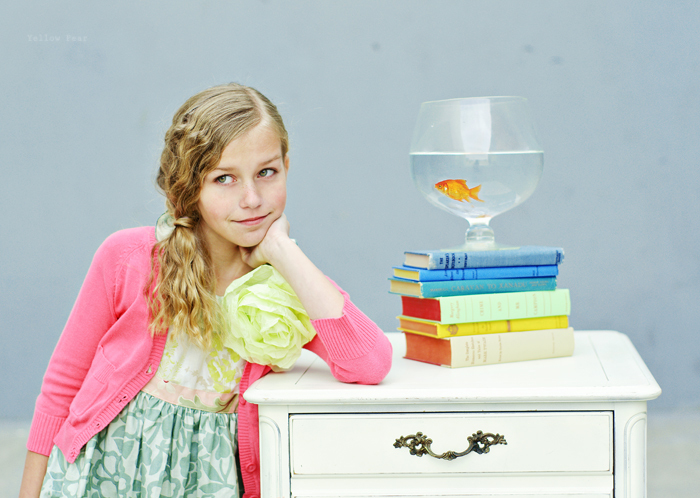 The goldfish idea is great. Again, your photography and your style amaze me! Ah, the all-inclusive antics of this adventure made me laugh right out loud. :) What GREAT shots! AND great ideas for props and places... I love that last picture most of all for some reason... It's enchanting. how on earth did you get pics like this under those circumstances?!! oh wait it cause you're the best!!! love love love it and your daughter is so dang beautiful!!! They are so colorful and crisp. I love these pictures. Great job!! Good luck! Fabulouso!! MJ is a star and B is stunning! Love them all! She is so gorgeous. How the heck did you narrow it down to one? Those pics of your lovely lil' lady are amazing! I think she has the contest in the bag!